This is the first of two surprise posts for Galen Central, celebrating our reaching of 500 followers on Twitter. The second story will be released Tuesday. But first, a sit-down with USC legend Cynthia Cooper-Dyke, who took over the USC women’s program this past spring. 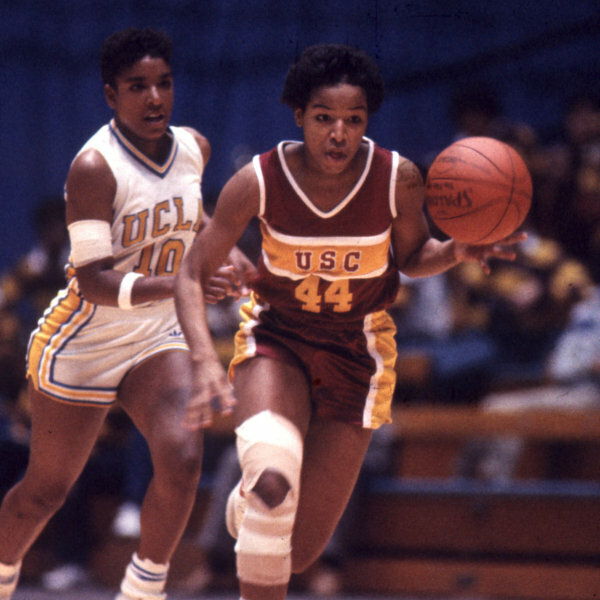 Cynthia Cooper-Dyke (@AllDecade14) has had many titles. She was a two-time WNBA MVP, four-time WNBA Champion and the first WNBA player inducted into the Basketball Hall of Fame, in 2010. With the title of coach at Texas Southern University, UNC Wilmington and Prairie View A&M, she amassed a 150-106 (.586) record with seven postseason appearances and three league coach-of-the-year awards. Now, her newest title in USC Women’s Basketball Head Coach, brought home to the school she helped lead to a pair of NCAA championships as a player. Galen Central caught up with her last week, and talked about the future of USC women’s basketball and how she plans to change the program’s culture en route to restoring its winning tradition. How are you planning on changing the culture of the USC women’s basketball program? Cooper-Dyke: First off, it’s going to be about changing the mentality into a winning one. What I mean about turning it into a winning mentality is really changing the way we focus, the way we practice, adding more intensity and investing a great amount of energy in becoming the best. Not only as a better team but as better individuals and players. For us, we are trying to develop a culture of winning and it starts with having that great level of work ethic. We are starting to put in those pieces of the puzzle in right now and we believe that it will translate into developing a winning mentality and putting some W’s up on the board. How do you think your players will respond to you differently as a former USC and WNBA player? Cooper-Dyke: Players react differently to me as a coach because I was a player in the sport in the league that they want to be in. In other words, I didn’t play in the NBA [like former USC head coach Michael Cooper], I played in the WNBA. I feel that this makes a difference because the players can now relate a little bit more to me. As a former USC student-athlete yourself, what are your plans on bringing former USC players like Lisa Leslie and Tina Thompson, who were also WNBA superstars, to practices and games? Cooper-Dyke: I don’t have any current plans but I would love to see some other former Trojans come back to support, whether it is for just one game or practice, and serve as a “Trojan mentor” to lean on and follow for these kids. I definitely want to reach out to Tina, who was a teammate of mine in Houston, and Lisa and really all the rest of the former Trojans to come back and support our program. In one word, how would you describe your coaching style? Cooper-Dyke: Flexible. I pride myself on being very flexible as a coach although there are some things that are deal breakers, with what we are going to do and how I want it done. At the same time though, I’m going to really try to morph into whatever my team needs for us to be successful. For example, it doesn’t make sense to me to run an aggressive man-to-man full-court press if I don’t have the type of players conditioned in order to do that. I believe in putting my players in the best position possible for us to be successful. Although it’s still early, what are the team’s goals for the upcoming 2013-2014 season? Cooper-Dyke: The team goal is always to win, but ultimately we want to win the Pac-12 conference and return to the NCAA Tournament. We just have to be willing to put in the work that it takes to make that jump. Our main goal right now is to work extremely hard to be at our best by the time that the season starts, and in turn, to be clicking on all cylinders by the time we start conference play. We want to be very, very competitive in the Pac-12 conference and really lay the foundation for what comes next down the line. How are you preparing your new team for the upcoming season? Cooper-Dyke: We’ve really gone back to the basics with our team. We are working on fundamentals: Passing the correct way to run a fast break, finishing around the basket, our work ethic and intensity level during practice. We are also working on conditioning and strengthening our bodies in order to get them ready for the season, while at the same time getting in the cardiovascular shape so that when it comes to crunch time, the last thing on our mind is conditioning. Which of your players has impressed you the most so far? Who are other players that have stood out to you? Cooper-Dyke: Definitely Cassie [Harberts]. Her leadership ability has really impressed me. Also, Kate [Oliver] has impressed me with her shooting as she probably has the best shot I’ve ever seen a 6’4 player have and I’ve been all over the world. She is smooth and confident and I just really love her game. Brianna Barrett has also impressed me with her leadership ability at the point guard position and has become more confident with attacking the basket and breaking down the defense, creating shots not only for herself but for others. Jordan Adams is finally healthy and she’s shown glimpses of a “pro” at the wing position, where she is absolutely phenomenal. How would you describe the way your team is going to be playing? Cooper-Dyke: Fun and entertaining. I would like us to play a style of basketball that is fun to watch and fun to play. I don’t want us to get bogged down in the half-court set, and want us to get out in transition and go up-and-down the court. However at the same time, I want us to be efficient, and I am the type of coach that likes to create scoring opportunities for our players. I look forward to our team being able to score in many different ways rather than relying on one single thing, like solely three-point shooting or points in the paint. How are you going to attract future recruits to come to USC? We have a great tradition of winning and we want to get back to that legacy of winning. We have a wonderful arena to play in [Galen Center], and we have top-notch academic services and training facilities. Now, we just need the top-notch athletes who know that the greatest way to become a star in the NCAA and to leave a legacy is to really be the name and face that turned a program around. We want players that are capable of turning our program around and get us the recognition and respect that our program deserves.